curious… what happened to your last short? which charting software are you using? I use Xtick! See what happened to my trade a few posts up! Good luck with the trade. The major risk events coming up make this a 50/50 play. Awesome, awesome week for the HLHB Trend-Catcher! 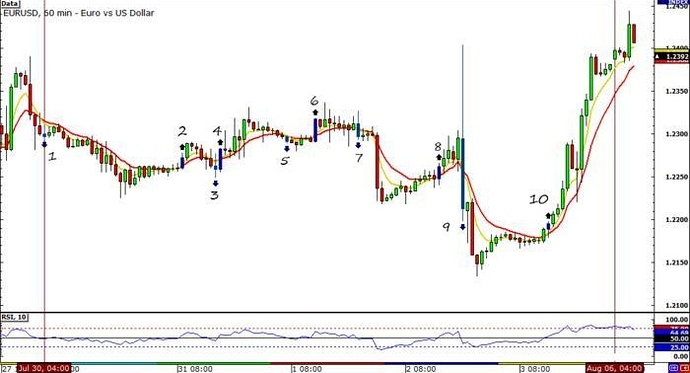 Thanks to the trending EUR/USD, the system was able to bag a net total of 297 pips! With the number of high profile economic events lined up last week, the pair exhibited a lot of volatility. I thought the HLHB Trend-Catcher would get faked out a lot, but thankfully, the pair made a lot of intraday trends. That, of course, was good for my system. Invalid signal since RSI was below the 50.0 level the candle prior. Long at 1.2273. Closed at 1.2259 due to new crossover. -14 pips. Invalid signal since RSI was already below 50.0 the candle prior. Long at 1.2283. Closed at 1.2292 due to new crossover. +9 pips. Short at 1.2292. Closed at 1.2318 due to new crossover. -26 pips. 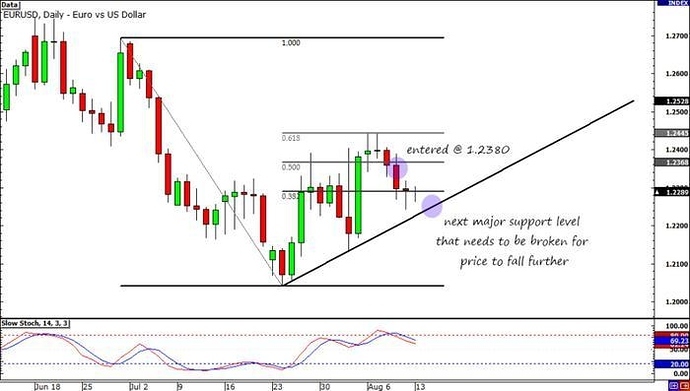 Long at 1.2318. Closed at 1.2297 due to new crossover. -21 pips. Short at 1.2297. Closed at 1.2262 due to new crossover. +35 pips. Long at 1.2262. Closed at 1.2354 when 50-pip trailing stop was hit. +94 pips. Short at 1.2213. Closed at 1.2184 when 50-pip trailing stop was hit. +29 pips. Long at 1.2193. Closed when 200-pip target was hit. +200 pips. I believe that the fundamentals are also in my favor. Yesterday markets were once again reminded that the European debt crisis is still far from being over. The euro gave up ground to most of its counterparts following rumors that the ECB would hold off purchasing bonds until the German Constitutional Court approves the ESM. On top of that, S&P also lowered its credit rating outlook for Greece from stable to negative. Sure, the shared currency sometimes rallies when risk appetite is up. But looking at the bigger picture, both fundamentally and technically, I think that markets are still bearish on the euro. That’s just me though! Because my technical and fundamental analysis have lined up, I’ve decided to sell at market. I’m ultimately aiming for 1.2100, but I’ll be taking part of my position every now and then if the trade goes my way. 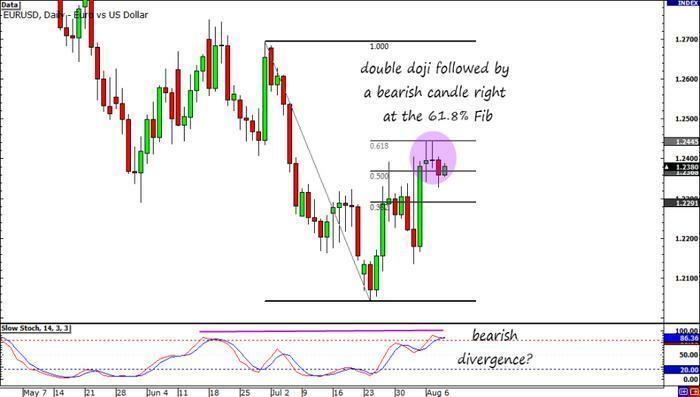 As for my stop, I’ve placed it 100 pips away, just a couple of pips above the 61.8% Fib. There ya go! That’s my trade idea for today. What’s yours? 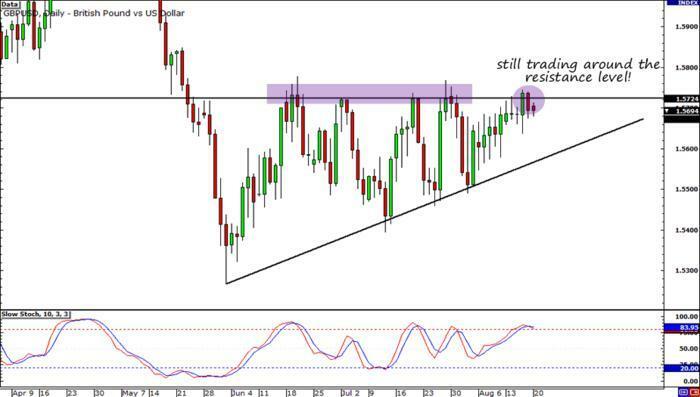 Remember the still-open trade that I cited in my last update? It closed with a 47-pip win at 1.2243 when the 50-pip trailing stop got hit. Invalid signal since RSI did not cross 50.0. Long at 1.2392. Closed due to new crossover at 1.2388. -4 pips. Short at 1.2390. Closed due to new crossover at 1.2424. -34 pips. Long at 1.2425. Closed due to new crossover at 1.2398. -27 pips. Short at 1.2398. Trailing stop hit at 1.2377. +21 pips. Invalid signal since RSI was not above 50.0. Short at 1.2351. Trailing stop hit at 1.2291. +60 pips. Long at 1.2314. Closed due to new crossover at 1.2275. -39 pips. I’d be lying if I told you that I’m contented with how my HLHB Trend-Catcher is doing though. I mean I’m happy with it, but I think I can tweak it more to make it even better. I’m thinking about removing the 50-pip trailing stop for weekend trades like what I did last week. I’ll replace it with a regular 50-pip stop if the trade remains open over the weekend. As I’ve said in my HLHB Q2 2012 review, all weekend trades that materialized during the quarter closed as winners. Also, the open trade that I pointed out in my last update could’ve hit my 200-pip profit target at 1.2396 had there been no trailing stop in place. What do you think? Please lemme know what your thoughts are by voting in the poll! Thank you! 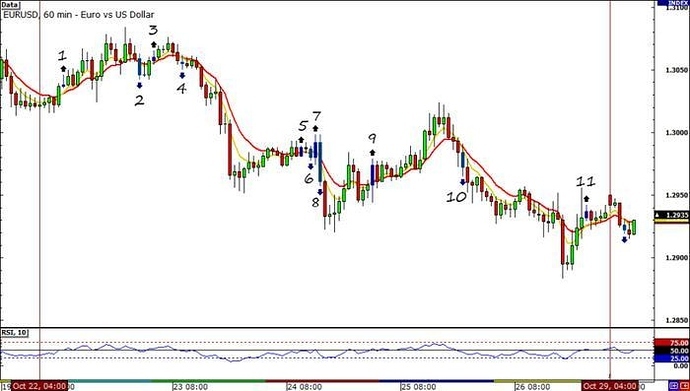 As for my EUR/USD trade, it’s currently up 89 pips. That may seem a lot, but I also have a wide 100-pip stop. This means that I need to let it ride the downtrend further so that my reward-to-risk ratio is more than 1:1. I am trading the daily time frame, which means I’ll be holding on to the trade longer than usual. It looks like the trend line held. Yikes! I’m moving my stop to breakeven to be safe. There were a lot of fakeouts last week, but thankfully, the HLHB Trend-Catcher still ended up positive. The gain wasn’t impressive though, as the system only bagged a grand total of 15 pips. Invalid signal since RSI was already below 50.0 before the downward crossover. Another invalid signal since RSI was over 50.0 before the upward crossover. Invalid signal since RSI was below 50.0 before the downward crossover. Long at 1.2296. Closed when 50-pip trailing stop was hit at 1.2225. +71 pips. Short at 1.2326. Closed due to new crossover at 1.2342. -16 pips. Long at 1.2342. Closed when 50-pip trailing stop was hit at 1.2337. -5 pips. Short at 1.2334. Closed due to new crossover at 1.2333. -1 pip. Long at 1.2333. Closed due to new crossover at 1.2323. -10 pips. Short at 1.2323. Closed due to new crossover at 1.2334. -11 pips. Long at 1.2334. Closed due to new crossover at 1.2311. -23 pips. Short at 1.2311. Closed due to new crossover at 1.2304. +7 pips. Long at 1.2304. Closed due to new crossover at 1.2283. -21 pips. Long at 1.2325. Closed due to new crossover at 1.2349. +24 pips. Invalid signal since RSI was already above 50.0. Another invalid signal since RSI did not cross the 50.0 level. 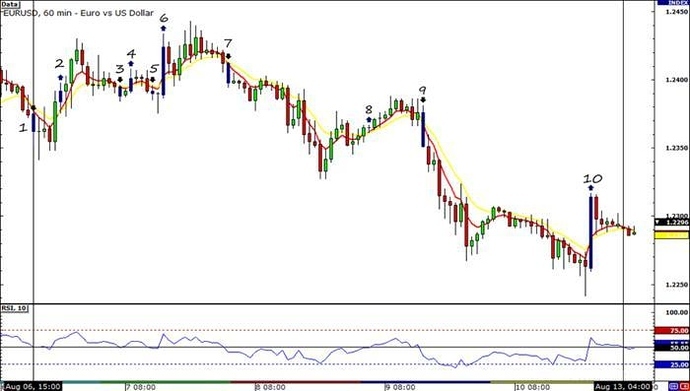 RSI was above 50.0 during the crossover. Invalid signal. As you can see, there were numerous fakeouts, especially during the middle of the week. What I’ve learned from the months I have been testing the system is that fakeouts are normal. Systems catch them from time to time, but you can’t completely eliminate them. I’m just glad that the system had another positive week. Invalid signal since RSI was above 50.0 before the crossover candle. Invalid signal since RSI was below 50.0 before the crossover candle. Long at 1.2507. Closed at 1.2556 due to new crossover. +49 pips. Invalid signal since RSI was above 50.0. Long at 1.2538. Closed at 1.2499 due to new crossover. -39 pips. Short at 1.2499. Closed at 1.2516 due to new crossover. -17 pips. Invalid long since RSI was below 50.0. Invalid signal since RSI did not cross the 50.0 level from above. Long at 1.2546. Closed at 1.2588. +42 pips. Am I bummed out that my system hasn’t been raking in a lot of pips? To an extent, yes, but I have to understand that it is the summer. During this time, the market tends to range, which means less trend plays and big moves. I should even be happy now that my system ISN’T losing. Most trend-following systems normally experience huge drawdowns in times like this. In my last trade idea, I incorporated the 100 SMA in my discretionary system. 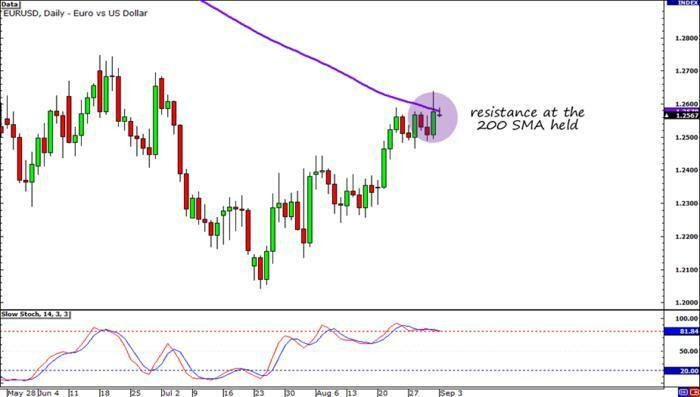 Taking a look at the indicator on the daily timeframe of EUR/USD, we see that resistance on the moving average held! Going into the weekend, I had a bullish bias on the pair because I was anticipating Fed Reserve Chairman Ben Bernanke to confirm QE3. Reports say that the central bank head honcho did hint at further easing. 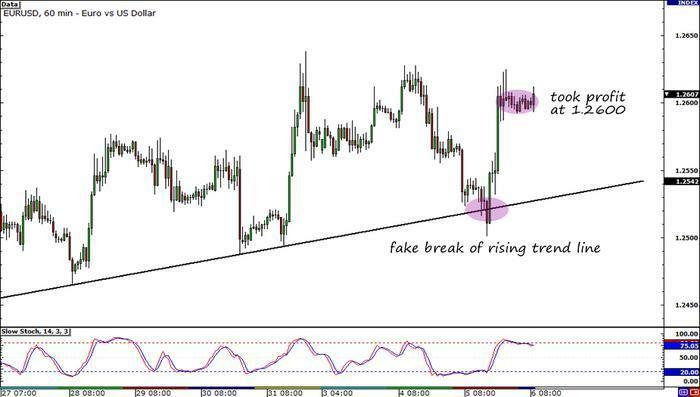 However, EUR/USD didn’t rally because of renewed concerns about Spain. To be honest, I don’t know if I should buy or sell the pair now. Nonetheless, I will still keep close tabs on it. I’ll gauge what the more dominant theme (i.e., the prospect of QE3 vs. the possibility of a Spanish default) will be and make my decision based on market sentiment. So, there you go! I hope y’all got in on the action on the charts last week. For those following my HLHB Trend-Catcher, the last signal that materialized (long at 1.2584) is still open! 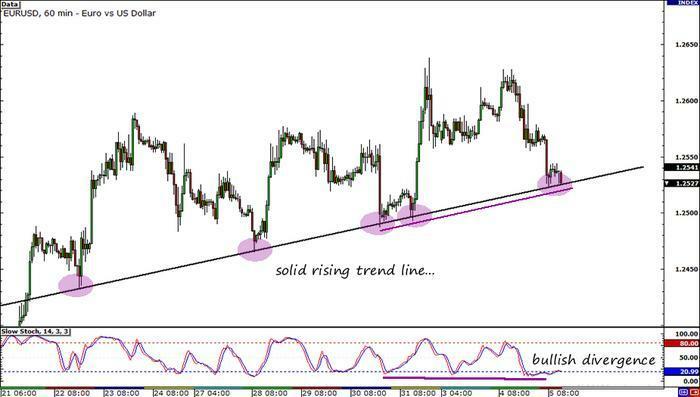 Do you see that very clear uptrend in EUR/USD’s hourly chart? I think going long ahead of the ECB interest rate decision might be a good idea so I bought the pair at market! Seeing that its dropped down to level 505 - 510 right now. I am wondering what your strategy would be now? Is there any support for a bounce to break even? I was also looking to go long at 20. But as I was drawing my pretty lines it started bouncing back. I then got in Long at 05. I closed off at around 65 as it starting getting choppy was worried it might fall again…Issues of having a full time job and trading. Ah, 'tis a sad week for the HLHB Trend-Catcher 3.0. Even though the pair trended upwards, the extreme volatility during the middle of the week distorted the RSI, preventing the system to jump in on the trend. In addition, the volatility the pair experienced also kept my trades from staying long enough to profit! But there is good news: the trade that was left open the week before ended up with a huge win. It closed at the first crossover of the week, which enabled it to bag 150 pips. 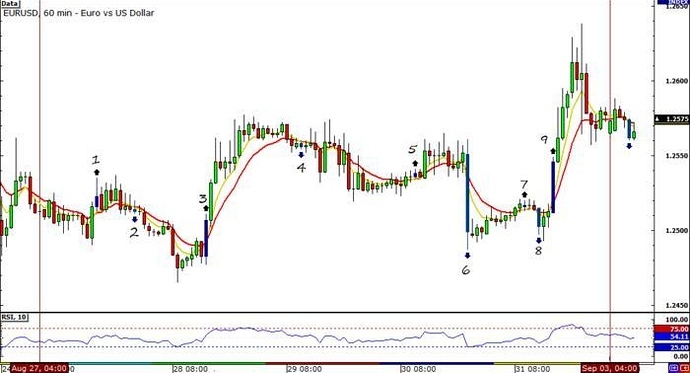 You can see clearly that EUR/USD mostly moved higher during the week. Unfortunately, the rally was also a bumpy one! The German Constitutional Court’s ruling as well as the Fed’s FOMC Statement caused the pair to spike a couple of times. Invalid signal since RSI did not cross the 50.0 level. Another invalid signal. The RSI was already above 50.0 when the upward crossover happened. Sold at 1.2780. Closed due to new crossover at 1.2778. -2 pips. Long at 1.2778. Closed due to new crossover at 1.2767. -11 pips. Short at 1.2767. Closed due to new crossover at 1.2805. -38 pips. Long at 1.2805. Closed when 50-pip trailing stop was hit at 1.2822. +17 pips. Invalid signal since RSI was already below 50.0 prior the crossover candle. Invalid signal since RSI was already above 50.0 prior the crossover candle. 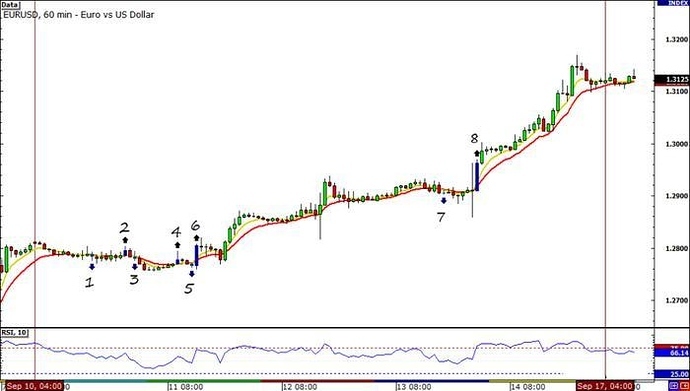 Overall, including the week prior’s trade, the system brought in a net total of 116 pips. Not bad! As I for my discretionary system, I didn’t get in on any action last week. I don’t want to sit on the sidelines for long though, this is why I’ll be keeping close tabs on USD/CHF in the coming days. 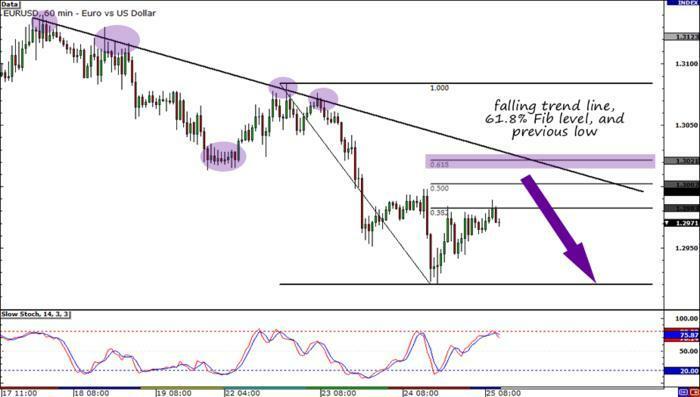 Should a valid trade setup materialize, you can count on me to pull the trigger! I hope you guys have a good week. Good luck! 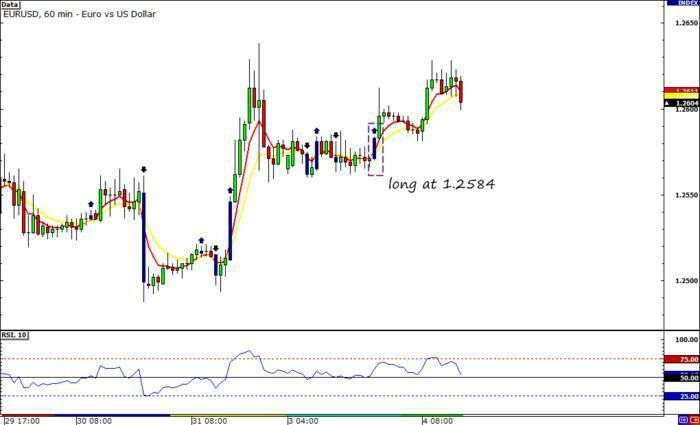 Long at 1.3038. Closed at 1.3046 due to new crossover. +8 pips. Short at 1.3046. Closed at 1.3060 due to new crossover. -14 pips. Invalid buy signal since RSI was already above 50.0 the candle prior the crossover. Sadly an invalid sell signal since RSI was already below 50.0 the candle prior the crossover. Invalid buy signal since RSI was below 50.0. Invalid sell signal since RSI did not cross 50.0 from above. Long at 1.2992. Closed at 1.2961 due to new crossover. -31 pips. Short at 1.2961. Closed at 1.2970 when 50-pip trailing stop was hit. -9 pips. Long at 1.2974. Closed at 1.2974 when 50-pip trailing stop was hit. Breakeven. Short at 1.2972. Closed at 1.2933 when 50-pip trailing stop was hit. +39 pips. Long at 1.2937. Closed at 1.2922 due to new crossover. -15 pips. All in all, the system generated a small 22-pip loss. While it certainly wasn’t a good week, it wasn’t a terrible one either. Indeed, good things come to those who wait! 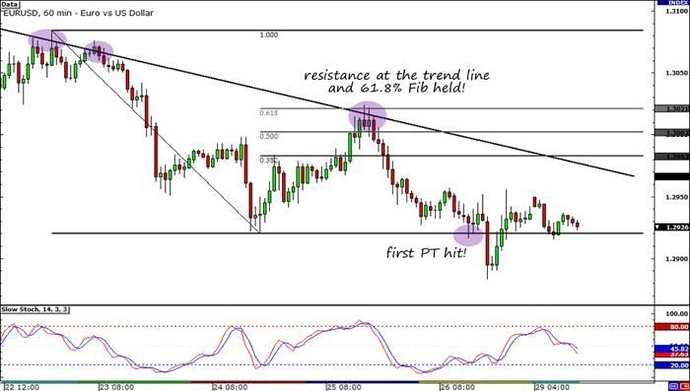 I decided to wait for EUR/USD to pullback to the 61.8% Fib level and test the falling trend line before jumping in on the downtrend. My strategy proved to be a good idea as price soon dropped and hit my first profit target at 1.2920. The fundamentals also lined up nicely to my trade idea. According to Pip Diddy, renewed concerns about Greece and Spain caused the sell-off in the euro. I still have half of my position left open and I think I’ll keep it there until I see any catalyst that could potentially shift market sentiment. Don’t worry, I’ve already moved my stop to breakeven! I hope y’all had a good week too!